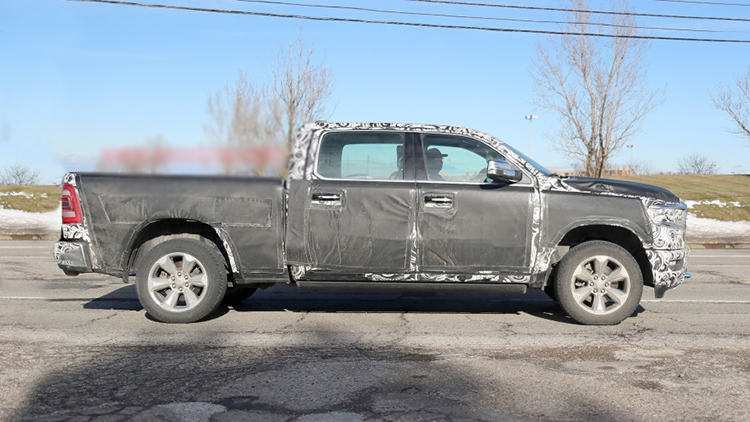 Sharp lenses of spy photographers caught the front fascia of the 2019 Dodge Ram 1500. So far, we could see an only heavy-covered truck with only a few details. But now, the image is almost complete. The dual-split tailgate is spotted few times on test mules. 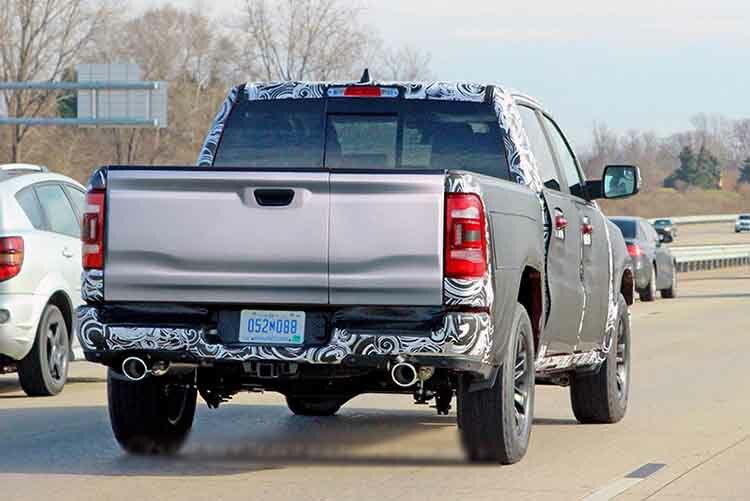 Nevertheless, it is not secure that this type of rear end will appear on 2019 Ram 1500. But, step by step, we are unveiling details about the upcoming pickup truck. During this year everything will be known about this vehicle and its sibling Dodge Rampage. Numerous changes are on the way for 2019 Dodge Ram 1500. We already mentioned dual-split tailgate and front fascia. There, truckers will find a new grille with a large Ram badge on it. Top of the range trims, such as Laramie, will get a special design of this part. 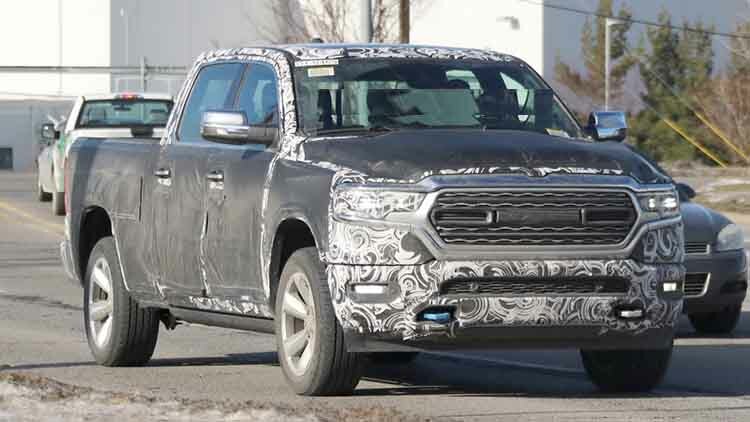 Also, an increase of the wheelbase for 2019 Ram 1500 is certain. With it, the truck will have more room inside the cabin. It can also lead to revisiting of cab configuration lineup. Previous editions receive only the praise for its RamBox storage inside the bed. Designers are about to revisit these, but these side boxes are definitely coming back for 2019 Dodge 1500. The entry-level truck will get a 3.6-liter V-6 drivetrain as the main source of power. But, the versatility of the 2019 Dodge Ram 1500 comes with its various engine configurations. Upper trims are getting either turbo-diesel or bigger V-8 powertrain. A 3.0-l diesel unit can produce 250 horses and 420 pound-feet of torque. It is even more twisting power than huge 5.7-liter Hemi drivetrain can produce. In combination with 410 lb-ft comes 400 hp. Finally, the 2019 Ram 1500 will offer a mild-hybrid drivetrain, which will be a harbinger of the plug-in or all-electric truck. The current model of the Dodge 1500 truck has plenty of options and configurations. There is something for any buyer. Besides four engine options, there are going to be 10 trim levels. Many of them will have choices – 4WD/2WD, one out of three cab configurations, and three-bed lengths. The least expensive 2019 Dodge Ram 1500 will cost $28,000, while the most luxurious will be around $60,000. Best American cars Copyright © 2019.